JOSH works in the slums and resettlement colony of Trilokpuri located in the Eastern part of Delhi. This area houses communities from across different regions, castes and religions. It is also known for violent communal riots and criminal activities due to the fact that it was created as a temporary slum as Delhi developed. Different communities and religions were forced together, causing a high level of communal unrest. These conditions make the youth living in this area vulnerable and there is a negligible support system available from the State to help youth. The situation is worse for girls, because not only do they lack the ability to access better careers and life opportunities, but they are perceived as the lesser gender within their community and have internalised this as their reality. In the community where JOSH works, girls are expected to contribute to the household at a very young age – with the implicit understanding that a girl is being trained for a role as a wife, mother and daughter-in-law, whereas boys are being trained for an occupation. Girls get married younger than boys, and families often think that the cost of education is wasted on a girl because it has no economic function as she will go to her in-laws’ home. Overall, the expectation of girls’ participation in family life hinders the educational and job opportunities for many. With growing restrictions in urban spaces, it is critical to work with girls and young women and empower them with knowledge about their rights and livelihood options. JOSH was founded in 2006 with the aim of engaging youth to bring about positive change in the society and in their lives. JOSH works through field interventions in the slums where it engages with marginalized urban poor youth and other community members to improve delivery of quality education and youth development. Their programs are spread across four major areas: 1) Right To Education Act advocacy and making government schools transparent and accountable, 2) Running a learning centre in Trilokpuri for young women focussed on vocational skills, gender rights training and communication, 3) Conducting workshops and meetings to mobilize students and parents on improving the quality of education, 4) Mobilizing youth-led community- based social actions. JOSH believes in the principles of ‘action learning’ and ‘learning by doing’, where the youth are encouraged to understand their surroundings and address issues of governance by actively engaging with the issues. This helps build youths’ perspectives as citizens and empowers them to make informed decisions as young adults. JOSH’s founders Sourabh Sharma and Aheli Choudhary are dynamic leaders; they led the Right to Information (RTI) youth movement against corruption in 2015 in Delhi on issues of governance, especially on education and citizenship. EMpower’s 4TH grant to JOSH will continue their program to enable 80 girls to gain employability skills and placement support. 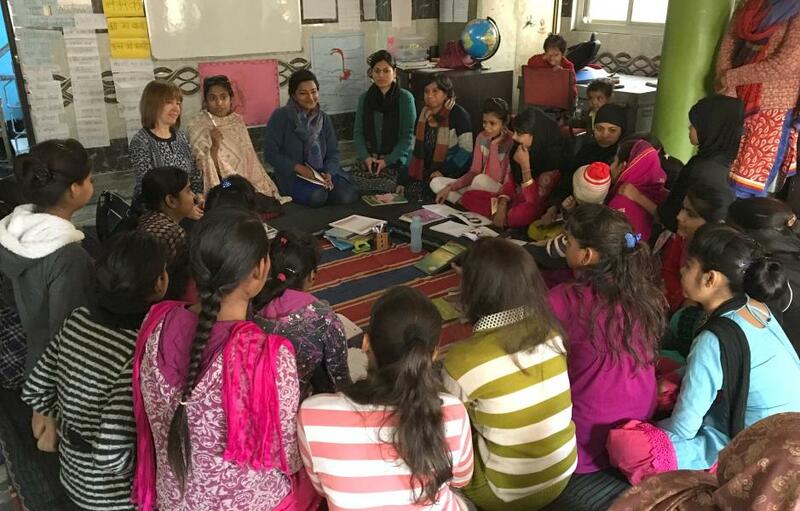 JOSH works with girls in an east Delhi slum resettlement prone to communal and gender based violence. Most participants belong to marginalized Muslim communities who lack resources, support, role models and training to pursue careers. Where is JOSH (Joint Operation for Social Help)? You can support our work with JOSH (Joint Operation for Social Help) and our other grantee partners.